The mighty Chris Devotion and the Expectations are headed for T in the Park this weekend. 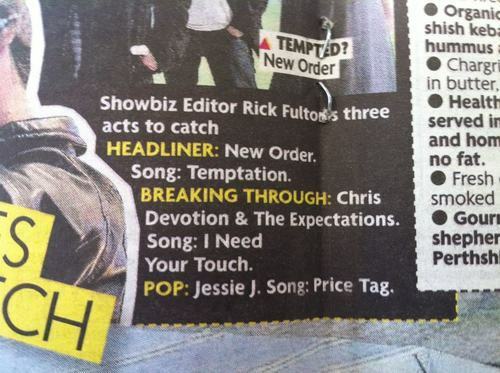 The band got a nice little recommendation in the Daily Record yesterday from Showbiz Editor Rick Fulton, thanks Rick! We can confirm that Chris Devotion and the Expectations will be performing on the T-Break stage at approximately 1:30pm on Sunday 8th July, so get doon and swing yer punts. You can listen to an interview with Mr. Devotion about all things CD/EX on this here PODCAST. See you in the mosh mud pit!